Derivative of lnx, derivative of log x2, derivative of ey,derivative of 2ˣ, Differentiation of raise to power function an easy and short cut manners, differentiation of raise to power function. Till Date we have learn to differentiate this question by taking log on both sides and then differentiate. This is very long process to differentiate this types of functions . But today we shall learn a different and an easiest method to differentiate such type of functions. then assume this function as [ log (Base) ]× [ Power ] then use product rule of differentiation and place the given function in front of the result so obtained. First Assume base x as Log x as 1st function and power function as 2nd function, then apply Product rule of differentiation, and place f(x) in front of the result so obtained. Now put f(x) in front of this result and that will be derivative of the f(x). 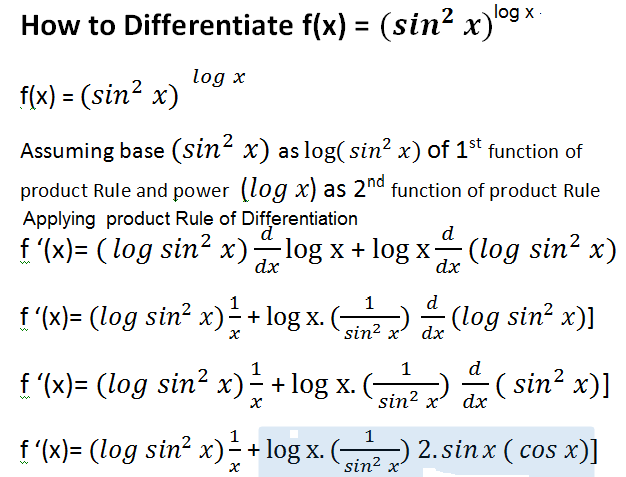 Thanks for devoting your valuable time for this post differentiation of raise to power function,derivative of lnx, derivative of lnx^2,derivative of e^y,derivative of 2ˣ, implicit differentiation calculator,derivative of log of my blog . If you liked this this blog/post, Do Follow me on my blog and share this post with your friends . We shall meet again in next post with solutions of most interesting and mind blowing mathematics problems ,till then Good Bye.